In a bowl, whisk together the mustard, red wine and garlic. Slowly drizzle in the olive oil to form an emulsion, then whisk in the herbs, salt and pepper. Rub the mixture over the lamb, coating the outside completely. Place the lamb in a large plastic bag and cover with any remaining marinade. Seal the bag, refrigerate and let marinate at least 8 and up to 48 hours, turning the bag occasionally to coat evenly. In a large bowl, toss the potatoes with the remaining ingredients, turning to coat evenly. Place the lamb in a large roasting pan and roast for 30 minutes. Remove from the oven and spread the potatoes evenly around the lamb. Return to the oven and roast until an instant-read thermometer inserted into thickest part of lamb registers 140 degrees F. for medium-rare, about 1 hour more. Remove the lamb from the pan and place on a platter to rest for 15 minutes before carving. Return the potatoes to the oven to continue cooking while the meat rests. 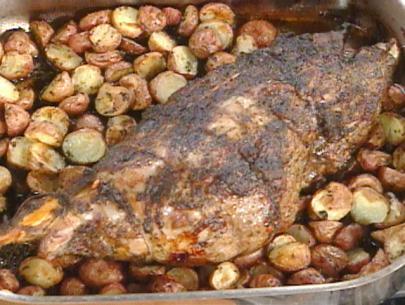 Carve the lamb and serve with the hot roasted potatoes.